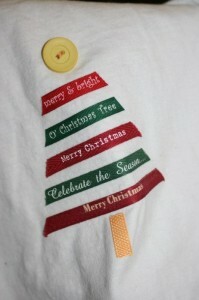 This entry was posted in kid fun, sewing, tutorial-ish and tagged applique, christmas, kids, ribbon, scraps, T-shirt. Bookmark the permalink. 2 Responses to Ribbon Christmas tree t-shirt. Wow sometimes i wonder how we have the same blood?? You are so crafty and me not so much! Love the T-shirt!! OMG Tara…. I’m not sure how you and Crystal are related LOL (just kidding Crystal) WOW you have a lot of cool stuff on here. When are you coming down to teach us your wonderful stuff??? I still want to learn just how to rip paper and make it look good, but your waaaayyyy past that now ha ha. And I love the shirt!